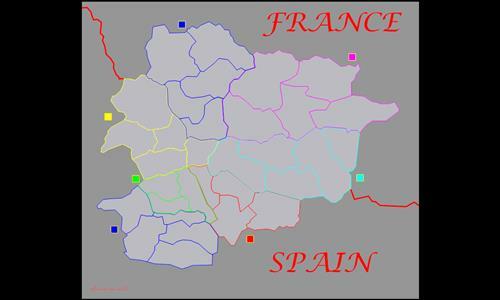 Map of Andorra, a small country situated in the Pyrenees between France and Spain. It's not a very big map but it could be suitable for games from 2 to 4 players. FFA or teams. Review by Жұқтыру on 6/29/2014. Nice map, overall, for quick battles. However, it's not too decorative (I hate the font that SPAIN and FRANCE is written in in ALL CAPS - just use another font or don't use ALL CAPS), and the country is bland (not your fault). Review by [NL] PAUL on 3/11/2017.